Who is an orphan? Why do so many people, including Christians, have broken relationships? Why is God called our Heavenly Father? How important are good relationships to life on earth and in Heaven? These questions and more are answered in Escape the Lie: Journey to Freedom from the Orphan Heart (Published by Randall House) by author and missionary Walker Moore. For more than 15 years, Walker has been delighting Baptist Messenger readers with his wit, wisdom and humor through a weekly column titled “Right of Passage Parenting.” His latest book exhibits the same practical wisdom drawn from God’s Word and speaks straight to the heart. Readers already familiar with Walker’s hilarious stories and anecdotes won’t be disappointed, as this book contains numerous powerful stories from his own life and experiences, as well as from others. Yet the work is even weightier, as Walker brings up some of the deepest topics of life, including our relationship with our earthly father and ultimately our Heavenly Father. Many who read this book will find the tools to mend broken relationships and bring to new heights family relations and friendships. Some will even find forgiveness from God for the first time. This book, unlike most books published today, is comprehensive in its worldview and has the potential to transform the reader’s life. For example, each chapter contains action points that the reader can immediately implement into life. Escape the Lie shows the Devil for who he really is (a liar, really the father of all lies) and God the Father for who He is. Whether you are a new believer or have been one for most of your life, this is one work you will not want to live without. It is readily apparent that Walker brings his many decades in church ministry and missions into focus, offering story after story, precept after precept, that will uplift you. 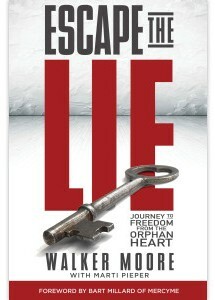 I highly recommend you order a copy for yourself and one to give away (available at Amazon.com or awestar.org). It could be the difference maker in your life between bad and broken relationships to Christ-honoring ones.